While refactoring a lot of the Credo conversion flow recently, one of the sticking points I knew I needed to tackle was the main conversion form. The form on any /team-member/ profile page, like mine. 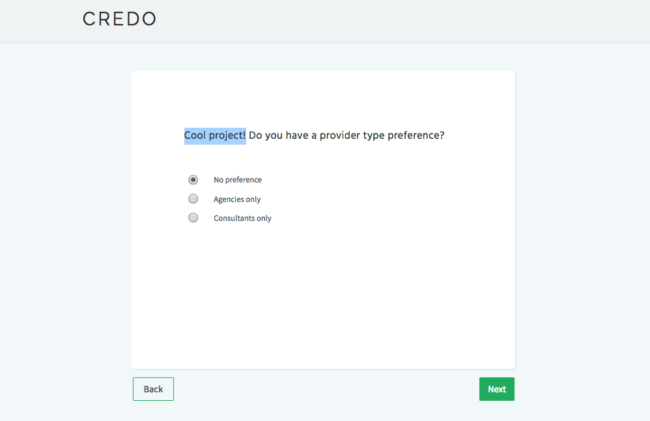 The main project creation flow is the most valuable both for businesses looking to hire and for Credo pros, so it is the one we want to prioritize. Links on deeper pages that did not provide any value and only distracted people from the end goal. Asking for too much information up front without psychological buy-in. Be more conversational and friendly to create a delightful experience as opposed to a transactional one. I think we’ve accomplished this. Let’s look at each step. After a quick explainer, the project creator can then select a few more options (or not) and continue on. We eliminated a step and already got the potential project creator involved in the process by having them select their main need, and we are limiting the potential for paralysis by analysis by limiting the number of services they can select at first. The old conversion flow was, at best, impersonal. 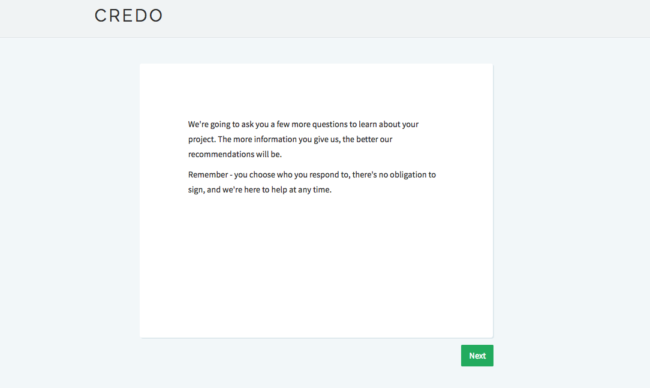 It just asked questions or made statements like “Tell us more about your project”. It did nothing to build trust or provide a delightful experience. No one likes filling out a form, even if you’re looking for something specifically, so why not try to make it a bit easier to do and delightful at the same time? 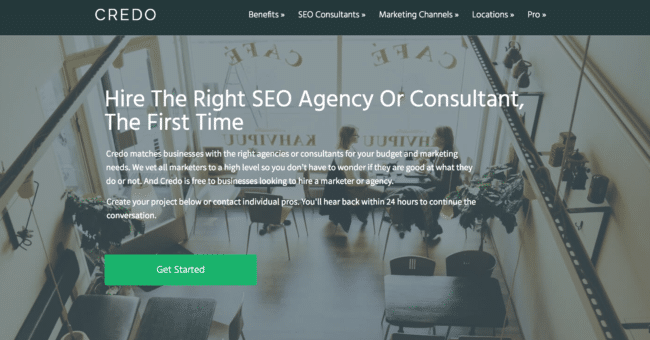 At the end of the day, I want people looking for a consultant or agency to work with to feel great about their decision to use GetCredo.com. For the most part, the fewer steps and form fields your form has the better your conversion rate will be. This is not always true, but I have seen a direct correlation between requiring less information and the conversion rate of GetCredo.com. That’s a lot of steps! 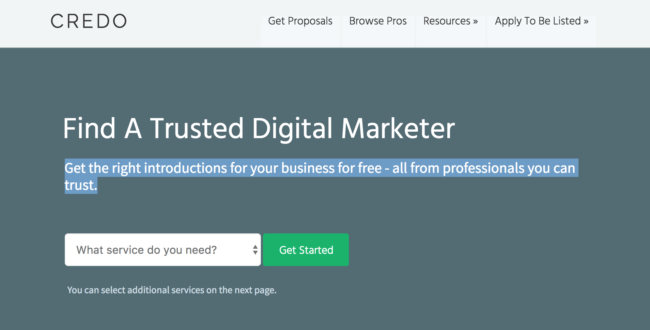 While I’ve been able to improve conversions by tweaking things, I always knew there was a better way to gather the same important information in fewer steps. We were able to meet our goals of fewer steps while still gathering the same information and clarifying steps that were confusing. We also eliminated a bunch of distractions – links on the explainer page taking them elsewhere, the top navigation – to keep their focus on creating a project. This also necessitated me getting over a test I ran years ago on a different website where removing the nav hurt conversions, so I consider that a win. Finally, we wanted to refactor the conversion flow to ask for information that people are often more reluctant to provide, such as budget and email, at the end after they are already committed. I realized that I have always done this to an extent with Credo simply because we need to collect more information in order to make the right recommendations. But, it’s also quite possible to make your form too long and require too much clicking which leaves people frustrated. I’ve been able to alleviate some of this in the past by selecting default answers to form questions. Once I did that, we saw a conversion uplift. But when I started thinking about the more and less psychologically taxing questions, and did some research into it, I realized that we needed to reorder the fields to a) get commitment earlier and b) help them find success earlier in the process by becoming committed. This new version should do that better, though there are definitely some areas I am nervous about and so we’ll likely continue testing and tweaking! 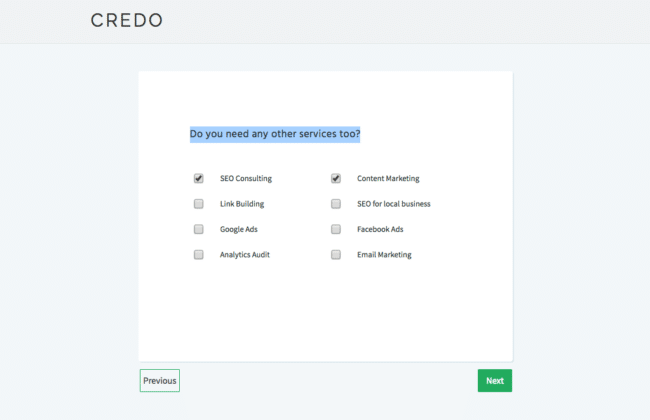 This has been the second post in our series about the new version of Credo and the thought that went into the features. I’d love your feedback and questions in the comments!